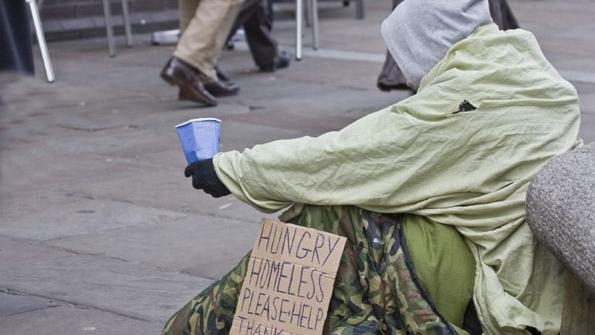 Hunger and homelessness is increasing in American cities and is likely to get worse this year if threatened federal budget cuts kick in, according to a report from the U.S. Conference of Mayors (USCM). The survey of 25 cities found that so-called “sequestration” cuts to local social programs could stress already stretched efforts to aid hungry and homeless people, according to Reuters. Cities struggled to meet those needs in 2012. Food pantries in 95 percent of cities in the survey reported that they cut the amount of food each person received. More than half the cities said some homeless families with children were denied shelter in 2012. The report spins a bleak forecast for 2013. Three-fourths of the surveyed cities expect greater demands for food assistance this year, while 60 percent project an increase in the number of families without shelter. The 25 cities in the USCM survey ranged across the country. They included Asheville, N.C.; Boston; Chicago; Cleveland; Dallas; Des Moines, Iowa; Nashville; Portland, Ore.; and Trenton, N.J.